Hello lovely people and welcome back to Alice Adores Apparel! Today's post is all about skincare, specifically skincare for severely dry skin. If you have followed my blog for a while you will know that, so far, I have't posted any beauty reviews. This is mainly because in all honesty I'm no beauty expert, I don't know the technical ins and outs of cosmetics, and I'm certainly not a trained make-up artist. However, in my short time traversing the blogosphere I've found that few bloggers review products from the point of view of super dry skin. If you have normal, combination, oily, or acne prone skin, there are plenty of amazing beauty babes out there who write/film product reviews that are perfect for you. Us desert skinned gals need a different kind of TLC in our products, so I decided to fill that void! I know what works for me and I've built up a mini library of skincare saviours over the years that I'd like to share with you guys. Every Sunday on Alice Adores Apparel is now #SkincareSunday, where I will post a new weekly review! Anyway on to my review of product numéro uno. Dream Cream is a long established Lush favourite. The self-preserving formula is a newer edition to the Lush family which was formulated in response to customer concerns over synthetic preservatives used in some of the naturally derived products. Although these preservatives are completely safe, many people like to avoid artificial ingredients, such as parabens, in general. The new self-preserving formulation has the same shelf-life as it's original counterpart, as well as the same level of performance. This lotion boasts an impressive set of highly effective ingredients. The chief moisturising element comes from organic extra virgin olive oil, an ingredient which has treated dry skin since ancient times. The cream leaves the skin gorgeously moisturised, a hydration which lasts up to 72 hours- something unheard of when you have severely dry skin! Lush have also whipped in rose water, oat milk, and chamomile blue oil. The effect is incredible if you have sensitive skin, because they calm and soothe any irritation. I often attend outside classes at my gym and find I tend to have a reaction to the grass when planking etc. Dream Cream has stopped any itchiness and relieved the inflammation on my forearms, every time. 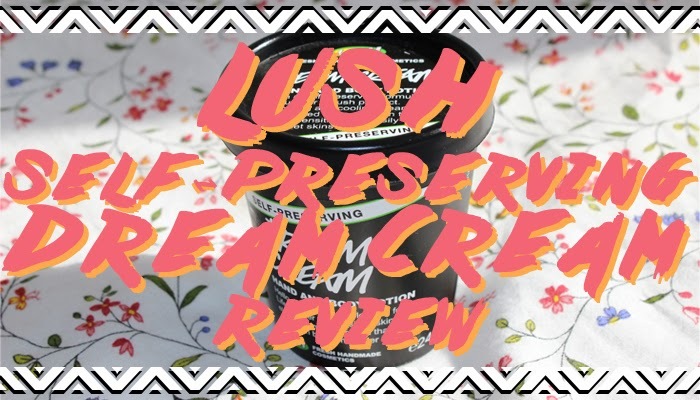 As their packaging states; 'At Lush Towers, we have files of customer letters telling us of their lifetime of skin troubles they have suffered from until they met Dream Cream.' I really enjoy the scent of Dream Cream. It's a subtle combination of olive oil, oaty baking, and traces of lavender oil. A strange sounding mixture but trust me, it's good! The texture of the self-preserving formulation is slightly different to the original Dream Cream. There is a slightly thicker consistency which personally I prefer. I find when you have very dry skin, the thicker and more luxurious a product feels, the better. Never fear though, Dream Cream sinks in very quickly and does not leave a greasy residue, so you can dress pretty rapidly after applying. I'm a big fan of this lotion. The impressive level of hydration makes it a great every day moisturiser. I would definitely recommend it for severely dry skin or as a luxurious overnight treatment for 'normal' skin. I hope you enjoyed my first review! Have you tried Dream Cream? What products do you recommend for dry skin? Let me know in the comments below! These days there are numerous approaches to treat the visual indications of maturing like wrinkles, scarce differences, Charlize Theron Face Cream hanging skin, imperfections, and so forth. Your skin type likewise figures out which anti-maturing skin cream will work best for you. Distinctive creams are accessible for sleek,Find Out More dry and mix skin types.